Proc. Re. No. 443/B2/C&T/SCERT/2015 Dated: 14--12-2017. 28-12-2017 - Guidelines, Plan of Action- Orders - Issued - Reg. Ref: Academic Calendar 2017-18 activities. All the District Educational Officers and Project Officers of SSA in the State are hereby informed that SCERT, Andhra Pradesh has developed Academic Calendar for the year 2017-18 in which GANITOTSAVAM-2017 (Mathematics Day) is one of the activities proposed in the month of December 2017. In this connection Department of School Education is decided to conduct Ganitha Sapthaham-2017 (Ganitha Mela) (Mathematics Day) an innovative Mathematics Festival related to promoting Logical Thinking, Reasoning, Creativity and Joy of Mathematics among children. It is decided to organize a 7-day festival in the month of December 2017. 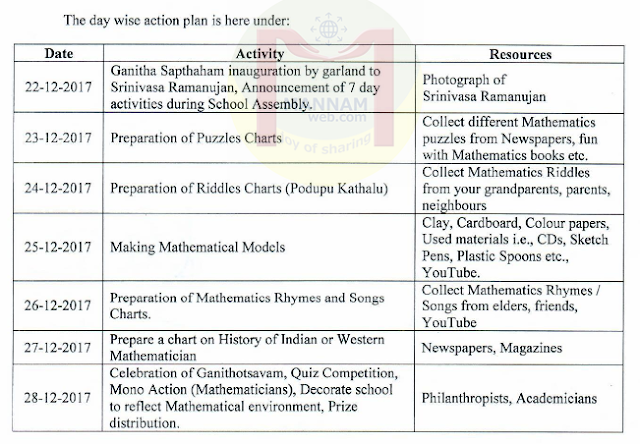 In this connection all the District Educational Officers and Project Officers of SSA are informed to issue instructions to all the schools irrespective of Managements to conduct Ganitha Sapthaham - 2017 (Ganitha Mela) (Mathematics Day) a 7-day festival in all the schools from class I - X from 22-12-2017 to 28-12-2017 in their respective district. Further, all the District Educational Officers are requested issue instructions to Dy.EOs and MEOs, to implement this event in all High schools and all School Complexes. For Primary level Ganitha Sapthaham - 2017 (Ganitha Mela) (Mathematics Day) celebrate at School Complex Level. For High Schools Ganitha Sapthaham - 2017 (Mathematics Day) at School level only. The detailed guidelines and Action Plan are annexed. All the School Complex Headmasters may utilize required budget from School Complex funds to conduct Ganitha Mela at School Complex level by involving all Primary Schools. • To create fear free Mathematics learning environment in schools. • To make enjoyment among students by participate in fun with Mathematics. • To know about contributions of Indian and Western Mathematicians. • To identify rural, cultural Mathematics in their surroundings. • To develop innovative pedagogic practices in Mathematics. • To conduct Metric Mela in School Complex by involving School Complex catchment schools. • To conduct Quiz competitions relating to Mathematics. Schools as Ganitha Sapthaham from 22-12-2017 to 28-12-2017 across the State. The Ganitha Sapthaham activity will be conducted for 7 days. Due to Christmas holidays the Sapthaham activities are designed to work at home by the students and teachers. On 28-12-2017 conduct Ganithotsavam celebration by conducting Quiz and Cultural Activities. The material prepared by the students should display in the school to create Mathematical environment in the school. Invite local academicians, Mathematicians for the festival. • Along with the above schedule conduct 'Metric Mela' at school complex on 28-12-2017. • This is a special school complex meeting for conduct of Ganitha Sapthaham by involving all teachers and students of catchment schools on 28-12-2017. • Teachers should train their students to participate, demonstrate and conduct their activity in Metric Mela. • Conduct Mathematics Quiz for the students studying 4th and 5th Classes. • Invite 2 expert teachers in Mathematics from nearby school complex to act as judges. •	Select 3 best performers from Metric Mela and 3 from Mathematics Quiz and award prizes to the selected students by the judges. • Invite parents to Metric Mela. • On the occasion of Srinivasa Ramanujan birthday which is celebrate as Mathematics Day in all Primary and High Schools in all the districts in the State of Andhra Pradesh. All the stakeholders are requested to play active role for the effective conduct of Ganitha Sapthaham from 22-12-2017 to 28-12-2017. • Conduct 1-day meeting with all MEOs, Dy.EOs, SSA Sectoral Officers and DIET faculty for the effective conduct of Ganitha Sapthaham - 2017 in all schools under all managements. • Communicate the schedule of activities to all schools. • District level observers visit all the schools and submit their visit report. • The consolidated district report will be sent to SCERT by the end of December 2017. •	Inform all Headmasters of high schools in the respective districts to the schedule of activities on the occasion of Ganitha Sapthaham - 2017 and instruct them to conduct the same without any deviation. • Conduct 1-day meeting with all School Complex Headmasters to conduct Metric Mela at School Complex level by involving Cluster Schools on the occasion of Ganitha Sapthaham - 2017 on 28-12-2017. • Manda[ Educational Officer are take necessary actions for the effective conduct of Metric Mela activity - Ganitha Sapthaham - 2017 Primary level in all School Complex in their respective Mandals. 22-12-2017 to 27-12-2017 and Metric Mela at School Complex on 28-12-2017. • This should be treated as a special School Complex meeting. •	Manda[ Educational Officer promote all the teachers, schools should participate in Metric Mela activity - Ganitha Sapthaharn - 2017. • School Complex Headmaster should communicate the detailed Action Plan and Activities related to Metric Mela - Ganitha Sapthaham - 2017 to all Primary Schools in their respective Cluster. • Make arrangements to conduct all the said activities without any deviation. • Invite Judges and Guest lecturers from near School Complex or any other place. Sapthaham - 2017 and submit the report to Manda} Educational Officer. • Utilize School Complex funds for conduct of Metric Meala - Ganitha Sapthaham - 2017. •The school Headmaster I Teacher allot work to all students prepare material by their own as per the schedule. • Motivate the students to prepare materials during holidays. • Prepare students to participate in Metric Mela at School Complex.